I actually read Day By Day Armageddon several years ago and really enjoyed it. When I saw the Audiobook on sale from Audible I knew I had to pick it up. While I did listen to a sample before purchasing I must say I still found the narration strange. If you've ever watched King Of the Hill there is a character named Ted Wassonasong and the way he talks reminded me so much of this narrators style. It's like he'd pause a bit too long between words as if calculating how exactly he should form each syllable. It was simply put, awkward. Narration quirks aside I actually found the Audiobook enjoyable. I love the added sound effects and also I have to hand it to the Narrator, he actually could voice female characters quite convincingly. Overall, as far as Audiobooks go I'm quite pleased. Now let's get into the details of the story. 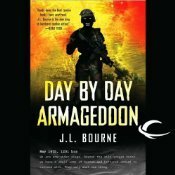 Day By Day Armageddon is the first in what I believe is a trilogy. The story is your typical Zombie Apocalypse fair and for the most part the Zombies are pretty standard as well. However, what sets Day by Day Armageddon apart is the Human element. 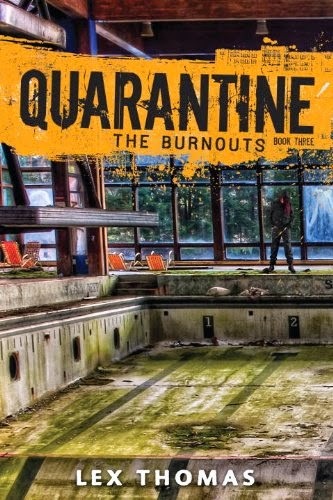 The Author isn't afraid to put his characters into messed up circumstances (wait til you meet Tara) and since the story is written in a journal format we really get to see how these incidences affect the main character. Another element that I really liked about Day By Day Armageddon is that the characters aren't locked into their little world. Sure survival in the here and now is utmost important but so is helping those trapped by the Undead. The MC sees it as his responsibility to help those in need and not just sit idly by in relative safety while those around him perish. He's a good guy in a very messed up world and I liked that. Even though this is my second time "reading" Day By Day Armageddon it is still a very enjoyable book. I liked the writing it is solid and I like all of the characters. My only real gripe with the book was the end. The main character is talking and as he is passing out the story just stops, it felt unfinished. A page or two showing something from an outside POV would've really helped give the book some sort of closure. With that being said, I will be rating Day By Day Armageddon by J.L. Bourne ★★★★. Do you have a favorite series on Audiobook? Well that about wraps up this weeks Zurvival Saturday. Come back next week where I'll be a sharing some of my favorite Zombie covers so far this year. As always like what you see? Please share if you do. Have a question or comment? Leave that in the comments section below. I love reading all your responses and appreciate that you take the time to leave them.